Choosing a locksmith company is definitely not easy. However, the internet has undoubtedly made our lives easier. You can find answers and search for reliable sources in a split second by using the internet. Also, considering the widespread use of the internet and the increasing number of internet users looking for information, most businesses have established their presence online. After all, it is the age of digital technology, where most businesses have quit traditional methods of marketing and promoting their services. To make it to the top of Google search results with a Google+ profile and a Google Business page, a company first needs to earn the trust of Google itself. If Google does not trust the company, their website, ads, and other sources will never be displayed on the search engine. This is clearly the first and foremost factor that determines the reputation and reliability of any locksmith company. In order to be listed on Google, a company needs to meet a number of criteria and fulfill requirements that can further highlight the genuineness of the company. If you are looking for a licensed and certified locksmith company by reviewing their Google+ profile, pay attention to the ratings generated on their profile page. This is a clear determination of their reputation as Google only accepts ratings from genuine users and customers. Google completely negates fake profiles and duplicated reviews or content. Half Price Locksmith has a Google+ rating of 4.6, given by genuine customers who have hired our locksmiths and used our services. Ideally, any company with a +4-star rating is definitely a reliable, genuine, and trustworthy company to work with. Google only wants authentic reviews from people. Therefore, the kind of reviews customers left on a specific locksmith company’s Google+ page is just enough to earn your trust. There are companies willing to sell fake reviews, but Google negates such reviews completely. Because Google aims to provide users with relevant and original information, the reviews left by customers on Google+ profile pages is a clear sign of the company’s professionalism, efficacy, and working attitude. Customers seem more than pleased with the services and professionals of Half Price Locksmith. Our Google+ page is filled with positive reviews by our customers in the region and most of our customers have given us a 5-star rating for our brilliant services. Once Google is completely satisfied with a company’s authenticity, those pages make their way straight to the business listings of Google. Everyone creates Google business pages however very few make it to the top. Also, to be listed under Google Business, a company needs to fulfill a lot of criterion with respect to their establishment, certification, registration, longevity, quality of services, and more. 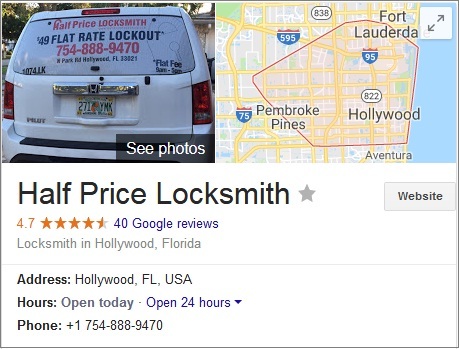 Half Price Locksmith has a professional Google Business page where our customers can go through reviews, feedback, photos, key business information like our working hours and contact details. You can also check our company location on Google Maps, which is completely secured and authorized by Google. By far, Google Maps listing is considered to be one of the strongest ranking factors for online businesses. Companies that have listings and customer reviews for years are t by Google Maps. 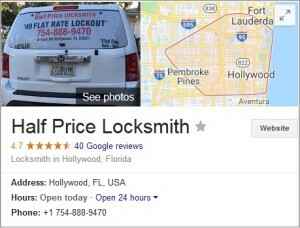 Half Price Locksmith has a strong presence and background on Google Maps listing. It not only helps customers find our company location but also gather essential information and credibility of our services. The Yelp review filter is literally known to catch and spot the bad guys over the internet. This basically means that Yelp is all about authenticity and untainted business listings. Yelp is basically a review and rating site only. Therefore, it is one of the best tools to search for certified locksmiths and licensed locksmith companies locally or globally. Long reviews and fake reviewers are not encouraged in any form on Yelp. The Yelp Review Filter carefully filters authentic businesses in the local areas. This leads to the Yelp Review filter having a stronger and powerful impact than most other review sites available. 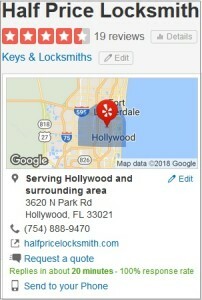 As it does on Google, Half Price Locksmith has established a remarkable presence even on the Yelp review filters. 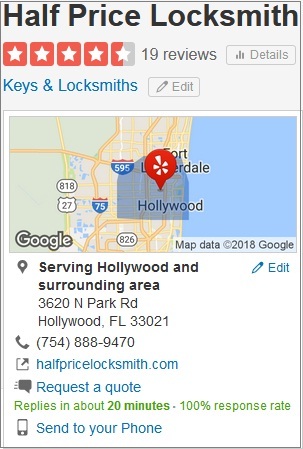 Because Yelp strives to assure that the reviews in their engine are completely clean and untainted by the business being reviewed, you can certainly trust the certification and credibility of a company like Half Price Locksmith through their Yelp profile. Yelp also has its own ways of filtering spam reviews and thus, any company with fake reviews and other spam content never makes it to the positive review line of Yelp. This is the reason why Half Price Locksmith still holds a strong standing and position on Yelp reviews. With complete authenticity and positive track record, our company has managed to satisfy innumerable customers and sustain a powerful online reputation through our Yelp and Google+ profiles. Amongst other citation profiles, Google+ and Yelp are the strongest channels to filter reliable and certified locksmith companies in your region. Because citation profiles are most review and ratings based, sites like Google and Yelp highlight untainted businesses with complete authenticity, making our task of finding certified locksmiths much easier and quicker.